Cellulose insulation is not only one of greenest types of insulation available; it’s also one of the most versatile. In various forms, it can be used as loose-fill insulation in attics, as a "dense-pack" insulation blown into enclosed cavities, and in wet-spray form for new construction. All types of cellulose insulation originate from the same source: old newspapers and other paper products that get to have a second life rather than be sent to the landfill. The processing equipment used to manufacture cellulose insulation grinds up the discarded paper pages, creating a fluffy shredded material. Before it’s packaged for shipment to distributors around the country, the insulation is treated with a natural borate solution, which makes it highly resistant to mold, insects and combustion. 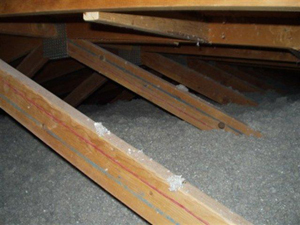 In its dry state, cellulose insulation can be blown into open, unfinished attic spaces and (with greater air pressure) into enclosed cavities such as stud bays. To make cellulose suitable for spray application into open stud bays (as found in new construction), the insulation is wetted with water and a binding agent. In a wet-spray application, the cellulose sticks to the studs and sheathing in an open stud bay. The insulation also sticks to itself. If the mix is right and the application is done skillfully, there will little or no settling and falling out as the wet-spray insulation dries out. Some amount of overspray is inevitable, so this excess insulation is usually cleaned up as soon as the insulating process is complete. It’s important for wet-spray cellulose insulation to dry out completely before the wall is closed in. Otherwise, mold and other moisture damage are likely to occur. Your best insurance against installation errors is to hire an installer who has extensive experience with this type of insulation.